It is with much sadness that the Club reports the death this week of Peter Theo in his beloved Cyprus after a long battle against cancer. 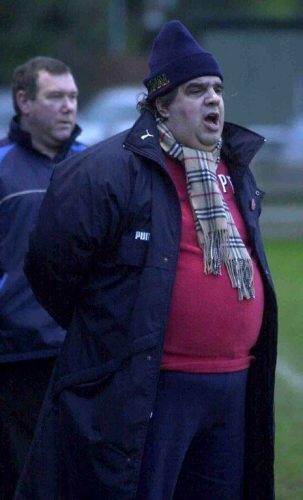 Peter who was a UEFA A-grade coach and had previously worked with the youth team players at Arsenal was appointed to the position of first team manager in October 2002 after the unexpected exit of Gavin Head and declared “I’m really pleased to take the job. I have fallen in love with the Club over the past few months, I believe in playing quality, fast football, modelled on how Arsenal play and I’m aiming for conference football in the next five years”. But that wasn’t the end of it as the players walked back for the restart Theo marched onto the pitch to remonstrate with the referee both verbally and physically – something I had never seen before – and he was immediately given a red card” and he resigned straight after the game. I’m not sure how I would sum up Peter’s 19 months at the helm. He was a lovely person, passionate about what he believed in and he wore his heart on his sleeve and was one of the most colourful characters ever to manage the Club.